Customer Service was excellent. The baskets I ordered for an event were perfect. Many compliments! Add something extra to make this gift more special! We are excited to now offer the option of customized ribbon for your gift package! Please enter your message exactly the way you would like it to appear on your ribbon - we will select colors to coordinate with your overall design. Please call us if you would like a logo or image printed on your ribbon. Seriously, call us. We love to talk to our customers as well as folks who are just browsing our site. You'll never get shipped off to a call center. We take our own calls and LOVE TO CUSTOMIZE every gift and make it personal. We are firm believers in the power of a personal referral. The greatest compliment that we can receive from our clients is a referral to their family or friends. To thank you for your confidence in us, each time we receive a referral of a new client, you will receive a gift certificate for a free regular delivery on your next purchase. Please let us know when you have sent someone to us, and when they make a purchase, we will send you your free delivery card. BasketWorks/79Gifts or its designated courier hand delivers most gifts in the greater Chicago area. This encompasses most suburbs within 50 miles of downtown Chicago. Please click here for a partial listing of cities to which we hand deliver. Please call us if you are uncertain of our ability to hand deliver. Monday - Friday, 9.00am - 7.00pm. Saturday Deliveries are available at an additional fee. Please call for information. Residential deliveries made when no one is available to receive the package will be left at a secure location or left with a neighbor. Monday - Friday, 8.00am - 5pm. Our courier service guarantees delivery by the close of the business day, but is not able to guarantee a specific time. Shipping and delivery costs average $18 for local courier delivery and are $18 (except for very heavy items) anywhere in the 48 contiguous states via UPS Ground. Heavier/larger items have a shipping cost of $25. Shipping to Hawaii or Alaska is via USPS and is based on the weight of the items shipped. Costs for 3 Day Select, 2nd Day Air and Next Day Air will be quoted upon request. We require approval of additional charges prior to shipping. Please verify your shipping addresses and include suite or apartment numbers. Wrong addresses will be charged a $5 re-delivery fee. We cannot deliver to PO boxes. Packages outside of our hand delivery area are shipped via UPS Ground. If you prefer to use another carrier, please contact us. UPS ground deliveries can take up to 5 days, depending upon the final destination (even a bit longer during the holidays). Origination zip code is 60062. 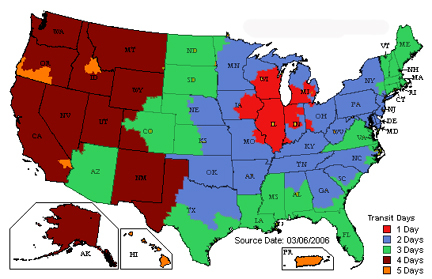 See map below for zones and estimated shipping time, excluding weekends and holidays. Basketworks is committed to protecting your privacy and developing technology that gives you the most powerful and safe online experience. This Statement of Privacy applies to the Basketworks Web site and governs data collection and usage. By using the Basketworks website, you consent to the data practices described in this statement. Basketworks collects personally identifiable information, such as your e-mail address, name, home or work address or telephone number. Basketworks also collects anonymous demographic information, which is not unique to you, such as your ZIP code, age, gender, preferences, interests and favorites. There is also information about your computer hardware and software that is automatically collected by Basketworks. This information can include: your IP address, browser type, domain names, access times and referring Web site addresses. This information is used by Basketworks for the operation of the service, to maintain quality of the service, and to provide general statistics regarding use of the Basketworks Web site. Please keep in mind that if you directly disclose personally identifiable information or personally sensitive data through Basketworks public message boards, this information may be collected and used by others. Note: Basketworks does not read any of your private online communications. Basketworks encourages you to review the privacy statements of Web sites you choose to link to from Basketworks so that you can understand how those Web sites collect, use and share your information. Basketworks is not responsible for the privacy statements or other content on Web sites outside of the Basketworks and Basketworks family of Web sites. Basketworks collects and uses your personal information to operate the Basketworks Web site and deliver the services you have requested. Basketworks also uses your personally identifiable information to inform you of other products or services available from Basketworks and its affiliates. Basketworks may also contact you via surveys to conduct research about your opinion of current services or of potential new services that may be offered. Basketworks does not sell, rent or lease its customer lists to third parties. Basketworks may, from time to time, contact you on behalf of external business partners about a particular offering that may be of interest to you. In those cases, your unique personally identifiable information (e-mail, name, address, telephone number) is not transferred to the third party. In addition, Basketworks may share data with trusted partners to help us perform statistical analysis, send you email or postal mail, provide customer support, or arrange for deliveries. All such third parties are prohibited from using your personal information except to provide these services to Basketworks, and they are required to maintain the confidentiality of your information. Basketworks does not use or disclose sensitive personal information, such as race, religion, or political affiliations, without your explicit consent. Basketworks keeps track of the Web sites and pages our customers visit within Basketworks, in order to determine what Basketworks services are the most popular. This data is used to deliver customized content and advertising within Basketworks to customers whose behavior indicates that they are interested in a particular subject area. Basketworks Web sites will disclose your personal information, without notice, only if required to do so by law or in the good faith belief that such action is necessary to: (a) conform to the edicts of the law or comply with legal process served on Basketworks or the site; (b) protect and defend the rights or property of Basketworks; and, (c) act under exigent circumstances to protect the personal safety of users of Basketworks, or the public. The Basketworks Web site use "cookies" to help you personalize your online experience. A cookie is a text file that is placed on your hard disk by a Web page server. Cookies cannot be used to run programs or deliver viruses to your computer. Cookies are uniquely assigned to you, and can only be read by a web server in the domain that issued the cookie to you. One of the primary purposes of cookies is to provide a convenience feature to save you time. The purpose of a cookie is to tell the Web server that you have returned to a specific page. For example, if you personalize Basketworks pages, or register with Basketworks site or services, a cookie helps Basketworks to recall your specific information on subsequent visits. This simplifies the process of recording your personal information, such as billing addresses, shipping addresses, and so on. When you return to the same Basketworks Web site, the information you previously provided can be retrieved, so you can easily use the Basketworks features that you customized. You have the ability to accept or decline cookies. Most Web browsers automatically accept cookies, but you can usually modify your browser setting to decline cookies if you prefer. If you choose to decline cookies, you may not be able to fully experience the interactive features of the Basketworks services or Web sites you visit. Basketworks uses Google Analytics for internal reporting of site traffic, demographics, etc. The Google Analytics Demographics and Interest Reporting features are used to collect this data. Basketworks secures your personal information from unauthorized access, use or disclosure. Basketworks secures the personally identifiable information you provide on computer servers in a controlled, secure environment, protected from unauthorized access, use or disclosure. When personal information (such as a credit card number) is transmitted to other Web sites, it is protected through the use of encryption, such as the Secure Socket Layer (SSL) protocol. Basketworks will occasionally update this Statement of Privacy to reflect company and customer feedback. Basketworks encourages you to periodically review this Statement to be informed of how Basketworks is protecting your information. Basketworks welcomes your comments regarding this Statement of Privacy. If you believe that Basketworks has not adhered to this Statement, please contact us. We will use commercially reasonable efforts to promptly determine and remedy the problem. BasketWorks/79Gifts builds each gift basket to order - none of our packages are premade. This allows us to offer our clients a high level of service without compromising quality and value. Please inform us of any special requests you may have in our "special directions" section. Note that because of this policy and to assure freshness and timely delivery, we reserve the right to substitute with product of equal or greater value. BasketWorks/79Gifts practices FIFO method of fulfillment - First In, First Out. Most orders received by noon CST can be delivered or shipped by the next business day. Allow for more time between November 15th and January 1st. We do appreciate as much advance notice as possible. Many of our gifts contain enhancements, mechanics, small miscellaneous products and non-edible components. These items are for presentation purposes and decorative use only. When gift wraps (shrink and cellophane) are removed, they should be immediately and safely discarded to avoid any potential accidents involving children or pets. Only the parent, guardian or custodian can decide whether components and enhancements are suitable or appropriate for the age and maturity of their child. BasketWorks/79Gifts or its designated courier hand delivers most gifts in the greater Chicago area. Residential deliveries are made Monday through Friday between 9.00 am and 7.00 pm. Residential deliveries made when no one is available to receive the package will be left at a secure location or left with a neighbor. Commercial deliveries will be made Monday through Friday between 9.00am and 5pm. Our courier service guarantees delivery by the close of the business day, but is not able to guarantee a specific time. Packages outside of our hand delivery are are shipped via UPS Ground. If you prefer to use another carrier, please contact us. UPS ground deliveries can take up to 5 days, depending upon the final destination (even a bit longer during the holidays). To check on time in transit, click here. Origination zip code is 60062. Shipping and delivery costs average $18 for local courier delivery and are $18 (except for very heavy items) anywhere in the 48 contiguous states via UPS Ground. Please verify you shipping addresses and include suite or apartment numbers. Wrong addresses will be charged a $5 re-delivery fee. We cannot deliver to PO boxes. For your convenience, BasketWorks/79Gifts is pleased to accept Visa, MasterCard, Discover and American Express. Additionally, we will gladly open a corporate account upon request. Please call for more information. For all packages being delivered in the state of Illinois, there will be a 10.00% state sales tax. BasketWorks/79Gifts is a woman owned gift basket company, located in the north suburbs of Chicago (specifically Northbrook, IL) since 1997. 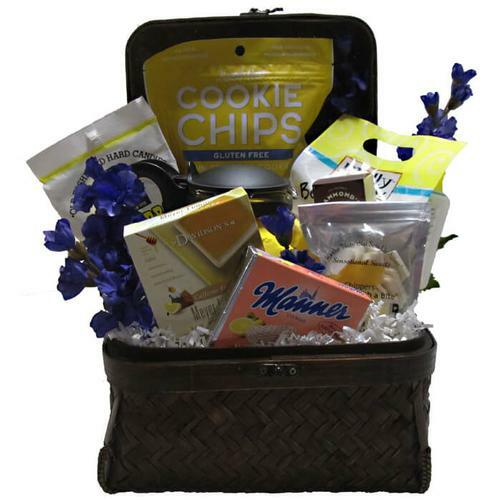 We are proud to offer a variety of gifts and gift baskets appropriate for all occasions. Each of our packages is built to order, allowing for customization at no additional cost to our clients. Our staff attends half a dozen or more gift and gourmet shows each year to search out new products, take continuing education classes and identify trends. We are not part of a franchise, but we do work closely with other independent gift basket companies from across the country. 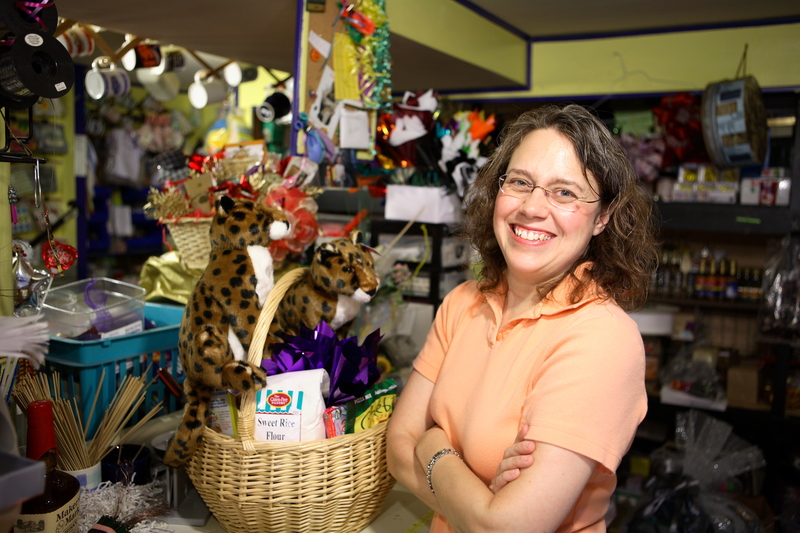 Lise opened BasketWorks after catching the entreprenuerial bug and leaving Human Resources in 1997. She has degrees in Business Administration and Labor and Industrial Relations, but enjoys the creativity involved in the gift basket business. Lise also has Crohn's Disease, an inflammatory bowel disease, and is open to speaking with anyone who needs more information. She enjoys reading several books a week, designing cross-stitch, crocheting, stamp collecting and advance square dancing. She has two boys, two weiner dogs, and one (very patient) husband. Multiple national industry awards, including 1st place for Executive Design. 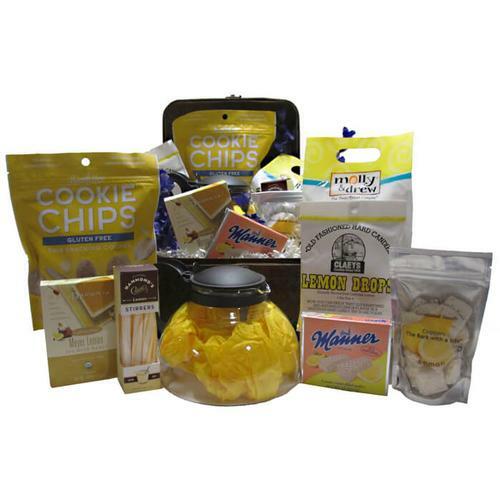 Named to Gift Basket Review's Top 50 Gift Basket Companies in 2005 & 2007. Awarded 2nd place in the First Annual Idea Cafe "Mom Grant"
Featured in the Chicago Tribune, on WBBM Radio and in "The Gift Basket Design Book"
Featured in Rave Reviews Magazine & GBA Digest. We use packing peanuts or cellophane scraps in the base of our baskets. However, in 21+ years of business we have NEVER purchased a single packing peanut. We accept clean, used peanuts from clients, friends and neighbors to reuse. Please feel free to drop clean packing peanuts or other reusable packaging materials at our offices. We are developing additional organic, natural, fair trade and low carbon footprint packages. Of course we regularly recycle and use florescent bulbs. If you would prefer to receive all of your invoices via Email vs US post, please let us know. At BasketWorks/79Gifts we are proud of the clients who have chosen us to help them with their gift giving. Here is a partial list of those clients - may we add your name? Password: Send me my password. 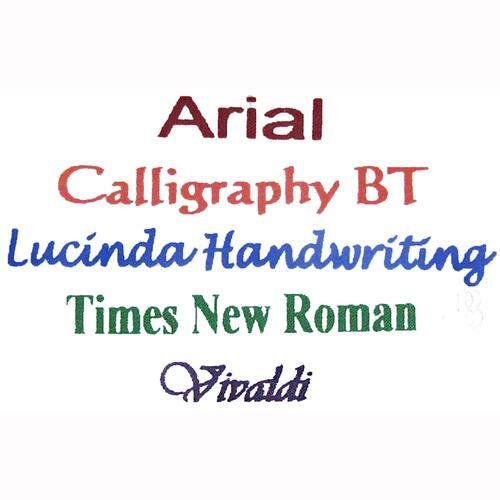 This site © 1997-2019 Basketworks, all rights reserved.